Pennywhistles and percussion make a marvelous musical combination. Here is a selection of videos to inspire you to make your own percussion instruments out of simple materials or found objects. The possibilities are endless, limited only by your imagination. Most of the instruments pictured here can be fitted with an improvised harness or strap for marching or moving. 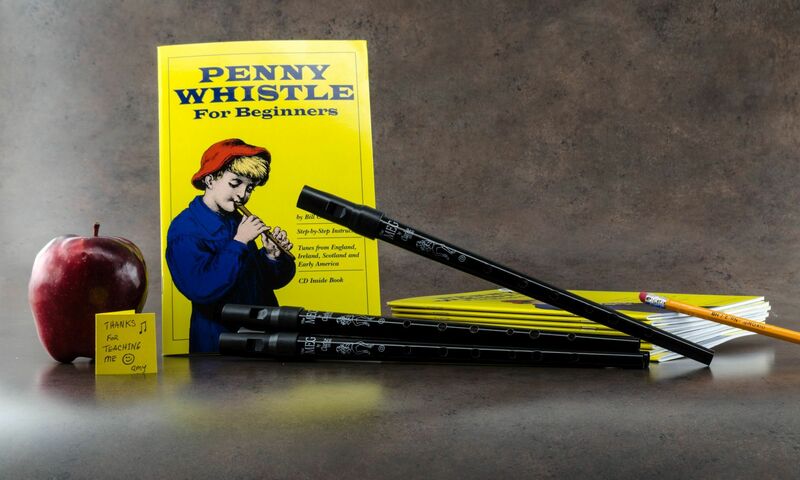 You don’t have to break your budget to create a great rhythm section for your pennywhistle marching band! Terrific ideas from Doug Fuller for making all sorts of neat percussion instruments from found objects. Legendary NYC subway bucket drummer Larry Wright (b. 1975) shown here at age 14. A caulking compound bucket, talent, determination, and a dream. Just great! A hand drum made from a large plastic container and packing tape by “johnnymichaelzucco.” Nice sound! Multiple layers of tape on this clever drum made from a discarded plastic cylinder by “ofirharlev” allow the drum to be played gently with sticks. Kal’s class project: a homemade drum kit from laundry detergent buckets, paint cans, and old skins. Another clever recycling of objects that might otherwise wind up in the trash. The cajon is a wonderful wooden box drum that is not difficult to make. The cajon is not used for marching, but makes a great addition to any stationary ensemble. An excellent demonstration by Jimmy Robeson.